Excerpt: In this post, we will explain what design thinking is all about. Originating from the innovation arena, it has gained popularity in other business domains, driven by the success of design thinking of radically focusing on the needs of the user — the how and why behind design thinking is explained in this article. Design thinking comes from the field of innovation and is a new approach, or process if you like, to solve problems taking the user as a focus point. 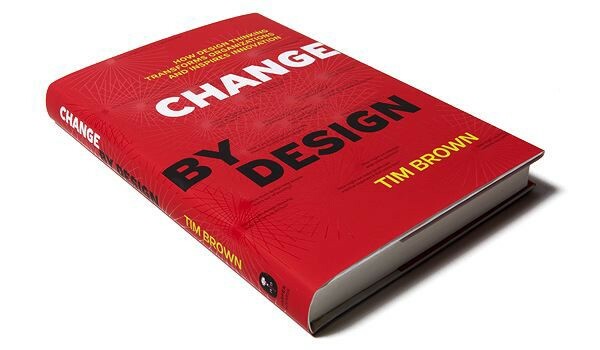 The method has been described as far back as 1969 by Nobel laureate Herbert Simon, but it really made a lift when d.school of Stanford University came up with a five-step approach to design thinking, which was given a boost by Tim Brown of IDEO, and explained in his bestselling book ‘Change by Design‘. In this article, we’ll describe their approach, as it is most commonly used nowadays, and very practical to implement yourself. Design thinking revolves around a deep interest in developing a deep human understanding of the people for whom we’re designing products or services. It helps you question and enables you to resist to act upon (often wrong) assumptions. Design thinking is extremely useful in tackling problems that are ill-defined or complex, by re-framing the question in human-centric ways. Design thinking is so successful because it focuses on the needs of the user — understanding culture and context through observation and qualitative research (storytelling) diagnosing the right problem. Okay, that sounds nice and all. But why do we need this? To put things short, we all think in patterns. We all have ways we are used to doing things — our habits, what we get taught in school, by our parents, and in the business place. Which is fine, as it helps us deal with everyday situations, we can rely on these patterns of thinking. We need this automatic behaviour to survive. If we had to make every decision consciously, or had to think about every behaviour rationally, or had to learn to do everything from scratch over and over again our brains would crash as we explained in our article about system 1 and 2 thinking of Kahneman. In short, we rely on doing every day – private and business – processes for the most part unconsciously — for example, when we get up in the morning, eat, brush our teeth, and get dressed. We don’t think about it; we do it how we are used to doing it. There’s one downside to this patterned thinking. It makes it very difficult for us humans to challenge our assumptions of everyday knowledge. Especially when you’re expected to be a paid expert, it can be tough to start questioning your own experience (also known as the expert fallacy or false authority). So, when we run into a problem that we haven’t faced before, or that requires a new innovative solution, we often get stuck or come up with old answers that aren’t always the best. Often this difference between repetitive patterned thinking and innovative thinking (also commonly referred to as ‘out-of-the-box’ thinking’) is illustrated by the truck example. Have you heard of it? If not, let us tell you this story. Some years ago, an incident occurred where a truck driver made a wrong judgment call and tried to pass under a low bridge that turned out to be too low for his truck. 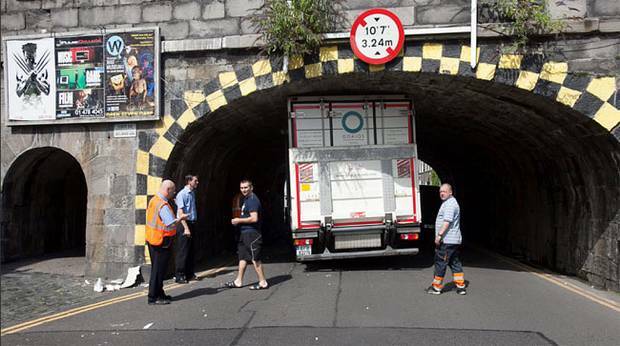 His truck got so firmly lodged under the bridge, that the driver couldn’t manoeuvre the truck through it anymore, but also couldn’t reverse his vehicle which not only caused a problem for the truck, but also for the traffic that got stuck behind him. The story goes that the fire department, other truck drivers, road help, and other experts came over to negotiate how to tackle this problem. Everyone was debating whether to dismantle parts of the truck or break down parts of the bridge. Each spoke of a solution which fitted within his or her respective level of expertise. And this went on for some time. The story goes, a boy walked by, took a look a the truck and then said, “Why not just let the air out of the tires?” which took all specialists and experts by surprise, who were debating for hours trying to solve the problem. When the solution was tested, the truck was able to drive through quickly. The story symbolises the struggles we face where frequently the most obvious answers are the ones hardest to come by because of the thinking patterns we all have within. And it summarised what design thinking helps you realise: design thinking helps you to change the way you tackle problems. It encourages you to explore new alternatives. Creating options that didn’t exist before. In this next part, we want to give you a concise design thinking masterclass. It will explain the principles of user-centred design. The first advantage and characteristic of design thinking are that it encourages us to take an integrative approach to develop new strategies or ideas. Whereas in a lot of ideation processes the research department passes on insights to strategic planners who in their turn pass their insights on to the creatives, and then the ideas are handed over to production to be made, design thinking sees insight, ideation, and implementation as three overlapping ‘cycles’. You will also come across to these spaces being called ‘understand’, ‘concept’ and ‘develop’. Design thinkers don’t follow these three cycles in a strictly linear way. You could pass through every cycle more than once. Could be you have an idea, but after prototyping your idea with real users, you come to learn they don’t understand it or didn’t do what you hoped them to do. Then you have to adapt your ideas. So, you go back to the drawing board. We always like to say that strategy is nothing more than a hypothesis that you test, build, and learn. We are firm believers the best strategy is developed through ideation and prototyping. Sometimes the feedback you get in prototyping gives you such an extra insight into the consumer decision-making process that you have to make a perception switch and come to a new understanding that will reshape your strategy. We like to call this process of including and being open to human psychology the concept of strategy development as opposed to the more inside-out concept of strategic planning. The task of a design thinker is to bring all phases together as one harmonious solution. The cool thing – we think – is when you have the design thinkers mindset you break through silos. Whereas the researchers, the creatives, and the strategic thinkers often work in different departments, now you get to go through all cycles yourself with a multidisciplinary team. Which not only makes your work more interesting but especially makes sure a lot of valuable insights aren’t lost in the process of handing things over to the next department. Design thinking is an integrative approach that adds value and fun. And which is a springboard for innovative, smart thinking that puts humans first. The first step of the design thinking process is called empathy. You try to understand human psychology and try to find out why people make decisions. The goal is to gain an empathic understanding of the problem you are trying to solve. You could do this in several ways. One of the most reliable methods is observation. Watching what people do. Why this is a proven method is because a lot of what people do is sub-conscious. If you’d ask them, they wouldn’t be able you to give you a (correct) answer. But you could also consult experts, extreme users, or do qualitative research to gain a deeper personal understanding of people’s emotions, needs, desires and fears. Empathy is crucial to a human-centred design process as it allows o set aside your assumptions about the world or your target group. It is all about understanding behavioural psychology and identifying behavioural patterns. In this stage, you put together the information you gathered during the empathy stage. This is where you will analyse your observations and refine and focus the problem you are trying to solve based on what you found while empathizing with your user. We often tend to define the problem inside-out. For example: “We need to gain 5% more market share in gym subscriptions by the end of next year”. But the whole point of design thinking is that you start thinking outside-in. So, your problem definition should also be human-centred. For example: “We need to help people to build the healthy habit of coming to the gym so fewer people will quit”. This is the stage where you try to come up with as many as possible solutions to your problem. Several techniques have proven to be very useful like brainwriting or the magic eight. It is essential to get as many ideas or problem solutions as possible at the beginning of the ideation phase. Behavioural research done to research the effectiveness of teams have shown that individuals are best at coming up with as many diverse ideas as possible, whereas a group is best at picking the most promising ideas. A technique used for this is called dotmocracy. If you’re interested in unlocking more creative power from a group, you could read our post ‘3 techniques that will supercharge your team’s creativity“. Prototyping is all about learning. Your job is now the make some inexpensive, scaled down versions of your idea that can be shared and tested with the actual users. There are several ways to prototype. You can write value propositions on a page; you can make a first landing page, you can create a storyboard or sketches. This is an experimental phase, so it’s not about making the perfect prototype. It’s about making a prototype that will help you gather valuable user feedback. We go about the testing phase by doing qualitative interviews with our end users or potential target group we are trying to influence. Very important to remember to tell and not sell. You’re not at the stage of convincing someone yet; you are here to learn where your product, service, idea, etc. needs improvement. Which parts are unclear? What turns out to be the killer feature? All the test insights will be used to do an ideation round again to optimise the idea based on real user feedback. There are a lot of tools and techniques to use to make every step of the design thinking process worthwhile. 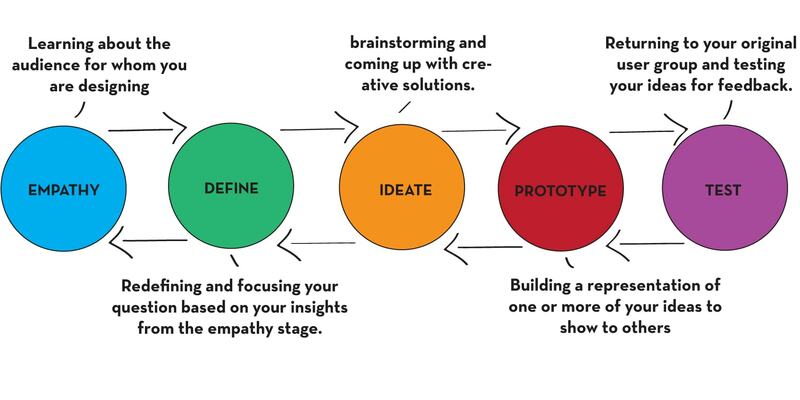 The masters of design thinking are the people of IDEO, and they did us all a massive favour by developing a design thinking toolkit that they’ve put online for all of us to use. Just take a look in there, and see which tools you like. 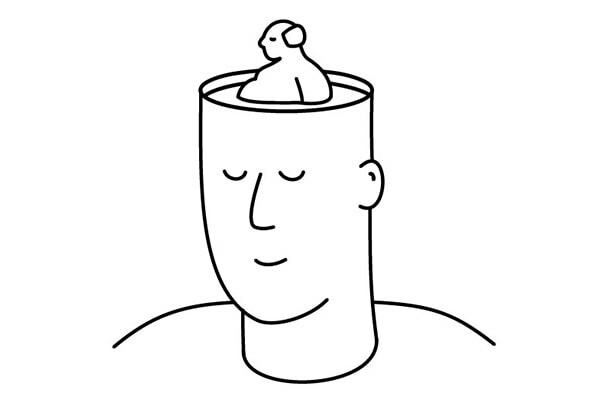 IDEO has also made a series of videos explaining the mindsets design thinkers should have. 1. Iterate, iterate, iterate featuring Gaby Brink. 4. Embrace ambiguity featuring Patrice Martin. 5. Learn from failure featuring Tim Brown. 6. Optimism featuring John Bielenburg. Design thinking is a process to come up with truly innovative ideas that are radically human-centred. The five-step approach of empathy, define, ideate, prototype and test help you to find solutions to problems with an outside-in view. Tapping into the consciousness and sub-conscious of your potential users. And helping you to validate your ideas before the money runs out.